The humble penny falls victim to a series of bizarre redesigns. Let’s be honest: American money isn’t pretty. Our bills and coins are jumbles of incomprehensible symbols–every spot of ink has meaning, down to the number of spikes around the treasury seal, but it’d be a stretch to say they all cohere into a worthy whole. Michael Bierut calls our currency “a cake that has been decorated to within an inch of its life.” What it lacks in aesthetics, though, U.S. currency makes up for in quirk. It feels old, authentic, a little mysterious, and therefore valuable. It’s money, after all. 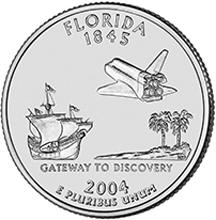 Then in 1999, the mint started giving each state its own quarter. The front stayed the same, but the back became embarrassing collages of tourism-board clip art (pity poor Florida, or Texas with only a map and a star). In 2003, the $20 bill was redesigned too, followed by the $50, $10, and $5. Meant to thwart counterfeiters, the bills turned all the great old symbols from their former selves into invisible watermarks and micro-printed marginalia. Then there are the big grotesque numerals in the bottom-right corners: no drop-shadows, no serifs, no swashes, no fun. Thankfully, the $1 bill has been safe from redesign since the ’20s and the penny has suffered only one in the last 100 years. The hope was that since counterfeiters don’t bother with low-value currency, us old-money enthusiasts would get to keep our bucks and pennies intact. Then came Public Law 109-145. The point of the 2005 Act is to redesign the $1 coin, scrapping Sacagawea for a portrait series of presidents and, for some reason, their wives. What’s more worrisome is Title III, which ordered a redesign of the penny. In honor of Lincoln’s 200th birthday, the penny fell victim to an image series of four cartoony tableaus of Lincoln’s life: his famously non-descript log cabin; a hilariously buff, superhero Lincoln reading on a log; a disproportionately statuesque Lincoln standing in front of the Illinois Capitol Building (which everyone will mistake as the U.S. Capitol); and finally the U.S. Capitol Building itself, bizarrely under construction. As a set, the coins look nothing like each other–“United States of America” appears in different type sizes; “One Cent” in different sizes and arrangements–and individually, they make no sense as a timeline of Lincoln’s life. It gets worse. Last week, the mint unveiled 2010’s penny–Lincoln on the front, as usual, and a simple shield on the back. Gone is the Lincoln Memorial, maybe the most emotionally and socially charged building in the country. Gone is the wonderful level of detail (remember when you first discovered the tiny Lincoln statue in between the columns?). Compare it to 27-year-old Matthew Dent’s redesign of Britain’s coins–the best use of a shield on currency I’ve seen. Dent’s redesign is contemporary but still complex; the coins work alone and as a set. Ours is simplistic and fake-looking. The penny is valueless enough as it is, and a one-dimensional design like this only makes matters worse. With the humble penny now a mess, I’m hoarding my $1 bills.